"I just wanted to let you know what a huge hit your Holofloors 2 was at our recent disco-themed event for a corporate client. It was the “Wow!” of the room. Even on a well used parquet dance floor, the results were terrific. I’ve been pushing this client to use this dance floor for at least 3 years and they were so excited, once they saw it, that I felt vindicated. People were coming from all over the venue to see it. We were glad to be the first to introduce it to our area. It also saved them thousands of dollars that it would have cost them to bring in a lighted dance floor. You made us look like heroes!" 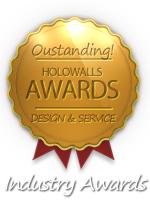 "The Holo-Floor 2 one time adhesive film from Holo-Walls is an incredible product. We used it to create a dance floor at a local venue here in Canada, and although it was our first time using it, we had no problems what-so-ever. The application was incredibly easy and quick; and removal was a breeze as well - noting the fact that we applied to film directly onto the venue floor’s surface. I would definitely recommend this product to anyone wanting to add some visual impact for their floor space at any special event. The Holo-Floor 2 is cost effective, of good quality, and extremely pleasing to the eye. Kevin is extremely helpful and easy to work with." "Hi Kevin, Good timing! I was just trying to get my head above water again and was going to send you some pics. We used the holo floor on a raised dance floor that was in the centre of the room reminiscent of a carnival float for a Carnivale themed event and it was fantastic for this application and went a very long way to making the success of the event. Thanks for your help." "Product worked great. We were so pleased with the transformation. I am attaching photos for you to see. The theme of our event was 'ICE' and under the blue hues the holo-floors actually transformed the dance floor to look like an ice skating rink. When the disco kicked in the lights gave a whole new effect. Thank you for your prompt service and follow up. Please keep us informed of any new items you may have coming out." "The two dance floors for the two different events we produced were fantastic! I was VERY nervous doing it ourselves, but it was sooo easy! I love the look and you'll be hearing from me every single time I can sell a client on it. Thanks for all your help, Kevin! Hope to meet you at an event soon." "The HoloWalls dance floor was a hit! It was amazing how the lightning made it come to life in all of these vibrant colors. We will certainly be using your products again!" Nelson Rios, Advanced Party Rentals.